Should Multicore Enhancement be on by DEFAULT?? Why is the average frequency on the right ~3772.9 for all the cores on that test. AIDA64 was used to test thermals and was only run for 5 min. and note again that a Corsair Hydro Series H115 280mm water cooler is being used. It will take ~1 hour for a 240mm liquid cooler to absorb heat and become saturated, so I wouldn't put much faith in a 5 min. test of AIDA64, which isn't going to produce the temps of real world scenario if a user were to encode or render for 1 hour. Temperatures in the 90 ºC range as LinusTechChips measured are only obtained with the CPU overclocked to 5GHz or so. Kirguru got 80--90 ºC. TechRadar measured a peak of 87 ºC when pushed the CPU to 5.1GHz. 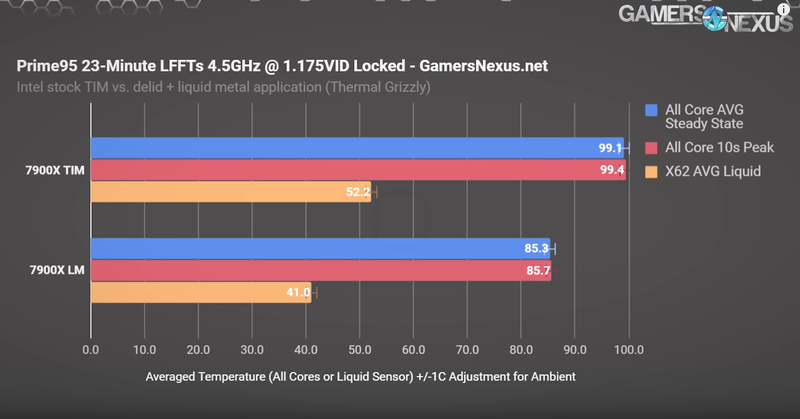 You overlook the cooling solutions and testing methodology that are being used to cool the 8700K even at stock settings! We leave the system to idle on the Windows 10 desktop for 5 minutes before taking a power draw reading. For CPU load results, we read the power draw while producing five runs of the Cinebench multi-threaded test as we have found it often pushes power draw and temperature levels beyond those of AIDA 64 and close to Prime 95 (non-AVX) levels. 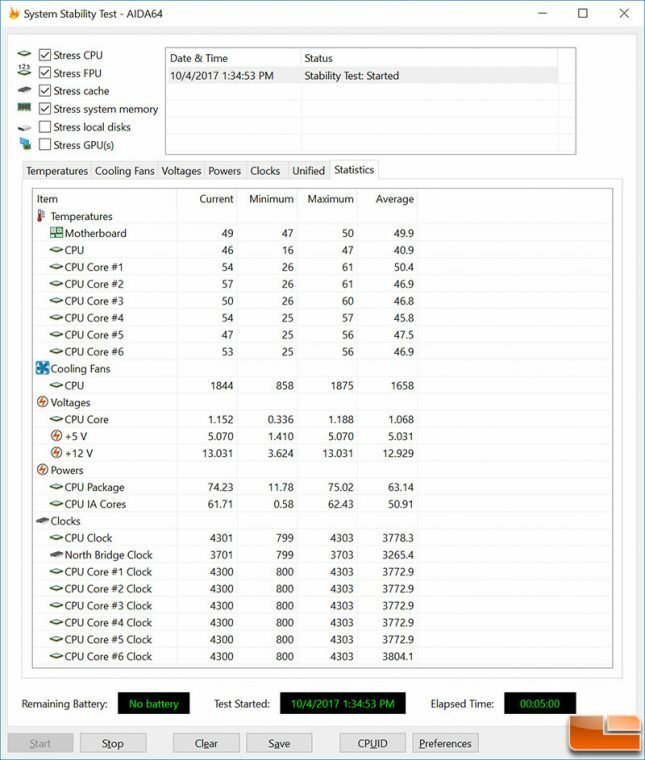 Even five continuous loops of Cinebench results in a short run time on high-performance CPUs which influences the validity of the temperature reading, so we run 5 minutes of AIDA64 stress test to validate data. The power consumption of our entire test system (at the wall) is shown in the chart. The same test parameters were used for temperature readings. Here comes the bad news. If you overclock Core i7-8700K the working temperature rises from 60 degrees to somewhere in the 80s. The explanation, as ever, is Intel’s lousy TIM. We have covered this topic a thousand times and are sick to death of saying it but here we go once again. The problem with cooling an Intel CPU is that the heat cannot escape from the package. Our 240mm Fractal Design S24 cooler can handle Threadripper but suffers with Core i7. Despite using more than favorable testing methodology for the 8700K the reviewer is obviously in distress over the findings. He is talking about "overclock Core i7-8700K". He is talking about i7 massively overclocked to 5.0GHz. TIM is not the problem. This has been explained a hundred of times and professional overclockers have demonstrated that delidding only gives ~5% better overclock. The reason why it is more difficult to cool a six-core i7 at 5GHz than a ThreadRipper chip is the heat density. The i7 chip is about 10x smaller than ThreadRipper chips. 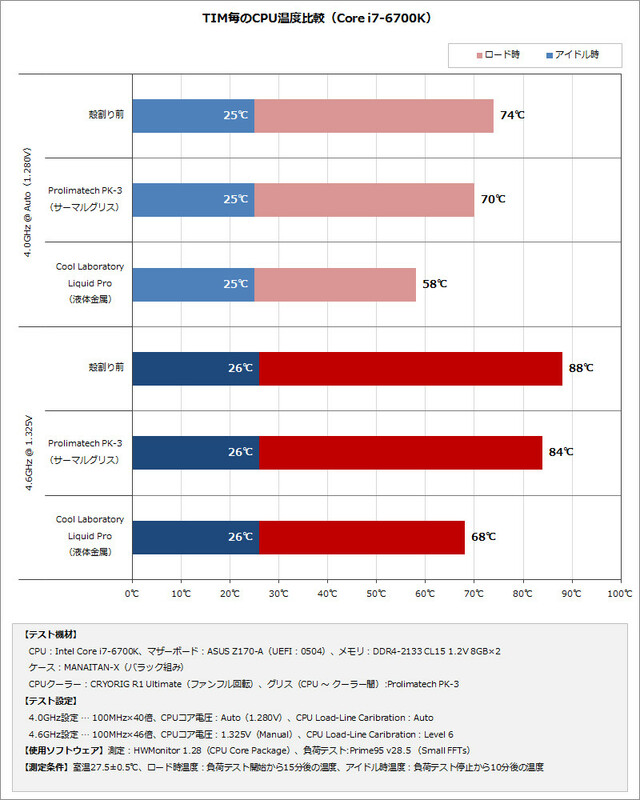 So heat is concentrated on a much smaller area, and it is more difficult to extract by ordinary methods; not to mention that no ordinary cooler can push Zen chips (ThreadRipper or not) to 5GHz. Delidding using liquid metal reduces temps up to ~15C over non delidded Intel processors. The cooling solution used plays a large role in this as well. Note some of the reviews Like Tom's Hardware Germany used a 1500W cooling solution with liquid metal! Edit: Addition information on the difference in cooling solutions vs.TIM vs. Liquid Metal. Our 4.5GHz overclock with a 1.175VID couldn’t reasonably pass the Blender render without the help of maglev fans and a 360mm cooler, otherwise we entered throttle territory with our Kraken X62 and NZXT fans. The X62 was therefore discarded for this test, leaving us to the more effective 360mm radiator and maxed maglev fans. Throttling becomes a serious concern when considering that we’re testing on an open-air bench around 24C, and testing in a case can easily bring internal ambient temperatures up to 40C. That’s why this is important – that’s what we’re trying to convey to Intel about using better TIM. The CPU has all this potential in it, but it’ll thermal throttle quickly if using the stock TIM. It’s squandered, and we’re not sure why. It could be process or it could be money, but Intel has done better materials in the past. Looking at the numbers, we’re at 63C with liquid metal and a 280mm cooler with NZXT’s stock fans. With TIM, the CPU was hitting 73C on a 360mm cooler with 3x maglev fans at max RPM. These are some of the best fans you can buy without going enterprise-grade, and the cooling setup was nearing 60dBA during testing. Even when it passed, it was unacceptably loud. That’s a 10-degree difference that favors the liquid metal mod when using a worse cooler with worse fans. That’s what this is about. Intel is creating a hidden cost to its CPUs: More noise and more money to get the things cooled under overclocks, and it’s awfully unfortunate. Even without overclocks, noise becomes a concern. The CPUs overclock exceptionally well – to the point that they start getting fiercely competitive – and Intel throws it all away. Given that Intel now has actual, real competition from AMD, it’s time to start paying attention to these “easy” points of improvement, relatively speaking. First, that is not what I said. I said that efficiency "is not a constant among workloads". It is not a constant because both performance and power consumption varies with each workload. That efficiency varies from workload to workload is 100% compatible with efficiency having a standard definition as performance per watt. Precisely I started my criticism of your TR link by mentioning that they are using a version of efficiency that disagrees with what everyone else uses. Second, RyZen is using, by AMD choice, a process node optimized for efficiency. One must recall that AMD's real interest is in servers, because that is where the real money is. AMD wanted to use efficiency-optimized node to favor EPYC CPUs, because efficiency is a key factor for servers. Third, moar cores lower clocked would have higher efficiency. because of the nonlinear relationship between clocks and power. Still the higher clocked 6C i7-8700k is more efficient than the lower clocked 8C R7-1800X. Fourth, Zen microarchitecture is optimized for throughput. The efficiency of Zen chips is better in throughput. what the reviews found is that the i7-8700k is more efficient than that R7-1800X on three different throughput workloads: Blender, x264, and CB15. Fifth, as explained before underclocking a chip is a easy way to increase efficiency. Take the i7-8700k, underclock it to 3GHz, and the efficiency will increase. Now port it to a process node optimized for efficiency as 14LPP and efficiency will increase. So CoffeLake is cheaper, faster and more efficient than RyZen. You're confusing 2 things: efficiency is a measurement and "optimality". You can measure wherever you want and draw conclusions based on what you measure for efficiency. And optimal points for the uArch+Process combination are usually chosen from factory. AMD, since it's still behind the required performance, they use higher performance trading off efficiency. Out of the box, the 1800X is not the best efficiency for Ryzen, but the top performer. Checking efficiency against it, is apples to oranges when comparing the i7 8700K is you ask me, since the i7 8700K is the efficient version of the uArch+Process combo due to the lee way Intel has over AMD. They are indeed mixed and the comparison are made (because why not) but you have to keep in mind WHAT you're comparing and not only HOW you are comparing. When Bulldozer came along, Intel just had a field day with Sandy and later releases. They just pushed for max power saving per node + uArch combination with no fear, not even the most efficient. I do remember Sandy getting it's most efficient point at 4.4Ghz! And guess what, that is the current speed range where the latest uArchs actually move in. Heavily misleading video, big disappointment coming from GamersNexus. Unless I am misinterpreting their bench (please correct me). The TIM results are non-delidded, stock Intel TIM. Whereas the LM results are delidded. This ignores the IHS/Adhesive gap in a stock configuration, so the results are affected by more than just the paste. Removing the stock adhesive will improve temperatures. In order for this bench to be accurate, he would need a tube of Intel's stock TIM, then de-lid and re-lid with the stock paste vs LM. He didn't mention the IHS adhesive at all during the video. The difference between TIM and metal is small and only really relevant to professional overclockers that want to break worldwide records as der8auer. I will make some remarks and will stop here, because this discussion is not going anywhere. (i) Efficiency is not a "measurement". Efficiency is a physical quantity. (ii) Glofo 14LPP is a node optimized for efficiency. Glofo 14HP is a node optimized for performance. The 14nm++ node used by Intel for CoffeLake chips is a node optimized for performance. (iii) No one said that 1800X is the more efficient RyZen. At contrary I clearly stated that efficiency goes as 1700 > 1700X > 1800X. I also explained why efficiency increases with lower clocks. (iv) The i7-8700k is the top performer CPU in the CoffeLake line. It is not an efficient chip. It is a chip designed to give the maximum possible performance. Taking this i7 chip and reducing clocks will increase the efficiency by the same reason that R7-1700 is more efficient than R7-1800X. (v) You started this discussion about efficiency by mentioning TechReport review. That TechReport review is using a non-standard definition of efficiency to claim that 1800x is the winner: "The Core i7-8700K delivers by slotting between the Ryzen 7 1700 and Ryzen 7 1700X, but the Ryzen 7 1800X is the winner among stock-clocked chips." As I replied then: "Using the ordinary concept of efficiency the i7-8700k was more efficient than the R7-1800X, because the 1800X was 7.93% faster on Blender but consumed 9.15% more power." (vi) KitGuru and HFR showed that i7-8700k is also more efficient in x264 and CineBench. So the i7-8700k is more efficient than the R7-1800X on Blender, Cinebench and x264; three throughput workloads that favor Zen microarchitecture. In lantecy worklooads the lead of the i7-8700k would be higher, because CoffeLake is optimized for latency. (vii) Intel has a superwinner in the hands. The i7-8700k is faster, cheaper, and more efficient than R7-1800X. It is a measurement. It's not an intrinsic physical property of elements in the universe. Da hell you going on about there? I've never talked about the 1800X, but the 1700. That is also reflected in my first post. But fair enough; at least we agree the 1800X is not the efficient one. And ironic how "at stock" the i7-8700K is the "more efficient of the lineup" in every other test and then you refute my claim of that one being optimized for efficiency. The 1600X is also close in second to it in most efficiency metrics, so you could also make the case for it. It's not a low clocked part either. And ok, let's stop here. We have talked about this and it's exhausting having to constantly repeat widely accepted common knowledge over and over again while you use random commentary to create arguments instead of facts based on evidence. I've told you before professional Overclockers like Der8auer don't even use liquid metal, but a conventional paste with LN2! But here we go again! Der8auer with Steve from Gamers Nexus at Computex Click here for link to Der8auer saying he uses conventional paste!It's not a coincidence that Der8auer replaces Intel's paste for a better one. We cannot use liquid metal, because liquid metal is an alloy. These tests were conducted with stock TIM, Prolimatech PK-3 and Cool Laboratory Pro thermal compounds, with Intel's stock solution being easily beat by both aftermarket compounds. With the Cool Laboratory TIM we see the most significant decreased in thermals, with the CPU dropping from 74 degrees to 58 degrees at stock settings and from 88 degrees to 68 degrees at an overclock of 4.6GHz. 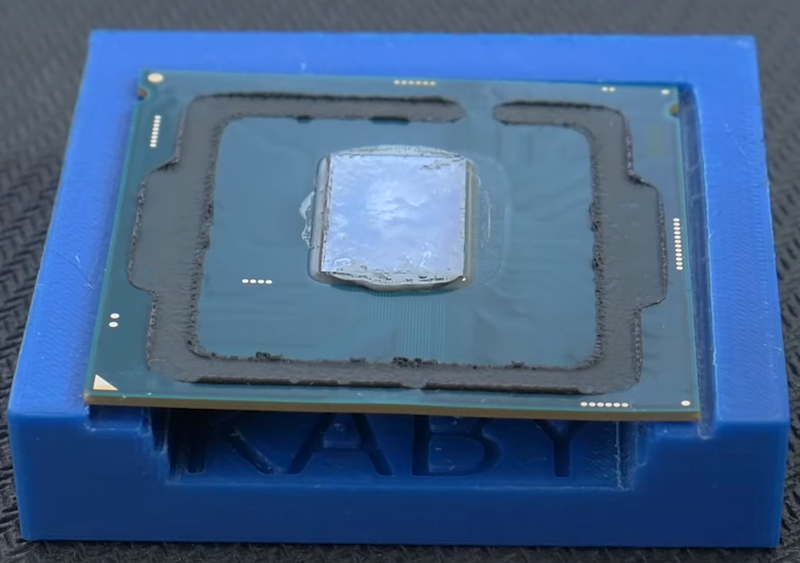 These results are highly significant, showing again that Intel's thermal solution is simply not as good as it can be, which will again force professional overclockers and enthusiasts to delid their chips in order to get the best thermal performance. This test was done with a delidded 6700K using the stock TIM. Then replacing it with a better thermal paste, and finally liquid metal. Let that be the end of thinking Intel's stock TIM being good, because it's rediculous. We have talked about this and it's exhausting having to constantly repeat widely accepted common knowledge over and over again while you use random commentary to create arguments instead of facts based on evidence. They aren't random comments. You mentioned a GamerNexus review, and I copy/pasted a comment on the flaws in that review and why GamerNexus disappointed him with that "heavily misleading video". I've told you before professional Overclockers like Der8auer don't even use liquid metal, but a conventional paste with LN2! But here we go again! I already commented how some people ignores the IHS/Adhesive gap in a stock configuration, and so makes incorrect conclusions about TIM. TIM is good, and the best proof is that delidding and replacing by something else is only needed by extreme overclockers such as der8auer. TIM is enough for 99.99% of users. TIM is good, and the best proof is that deliding and replacing by something else is only needed by extreme overclockers such as der8auer. TIM is enough for 99.99% of users. You're missing the point heavily there. Henry Ford once said: "Any customer can have a car painted any color that he wants so long as it is black". That doesn't mean you want black nor think black is the best color (actually, it's the most dangerous color for a car) nor that black is the best technically speaking nor that Ford could only use black (this is the important bit). Intel, as the mega corporation it is, chooses an under-par thermal compound that has been demonstrated to provide poor cooling on products it sponsors as "overclocker fiendly". Case in point: K series and HEDT CPUs. If you can't see the contradiction in there, I guess it's a moot point to keep this conversation going. Now, you try to deflect from the topic by introducing Der8auer collaboration with Caseking to extort people out of their money, because Coffee Lake was a paper launch, and their are no CPU's available for the general public. 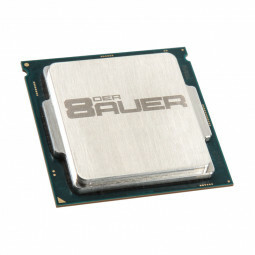 Even Der8auer replaces Intel's stock TIM!!! You lost the battle and the war. It's well documented. I will not comment further the overwhelming data that can be found by a simple google search supports my claims despite what you read from random commentators on YouTube! Edit: Once last pic for everyone viewing pleasure. A delidded i7-7700k look at the thin spread of thermal paste over the die, and how much was pushed out to the edges. Look how thin the glue is that was used to hold on the IHS. This is the same information as in the video. With the i5-8400 it's worth mentioning that Steve did test blck overclocking and MCE on a few boards, and the non-K models get detected. They are locked out at 102MHz BLCK, and MCE all core turbo is disabled. ^ not the cheapest though really is it?? The benchmarks are in all honesty closer than I expected. Juanrga, Goldstone77, - please tone down the rhetoric and behavior in this thread. You have been warned multiple times in other CPU related threads and this thread has been derailed and is getting beyond ridiculous. Be civil or there will be consequences. There are multiple moderators watching. You can choose to be constructive and have civil conversations. If you don't, the choice is up to you. Consider this your one and only warning. In gaming the i5-8400 is much better ~30% using a 1080Ti to as little as 5% FPS to using a Vega 64. Again we can see Vega with some titles shows much better FPS with Ryzen compared to Nvidia. In performance tests encoding/blender/multi-tasking the 1600 for the most part performans better than the i5-8400. I would still consider Ryzen R5 1600 a better overall value depending on needs for budget PC's until the cheaper Intel motherboards come along. Pairing an i5-8400 is still looks to be good choice IMO if gaming is your main concern matched up with the cheapest available Intel motherboard ~$120 here in America at least. Just for those Canadians lurking here, the 8400 is $240 whereas the R5 1600 is $265. However you will save a fair bit on a mobo when going with AMD (at least right now) so your Ryzen should still cost less overall. Again, according the conversation here, the 8400 puts your ahead for gaming, but the 1600 sets you up for a better machine overall. 8600k is $330 and R7 1700 is $370. There is more of a price gap here but again your mobo is cheaper and you can use the stock AMD cooler whereas the intel needs an AIB. Whether the same performance logic applies at the 8600k vs R7 1700 level, idk. B350 boards are cheaper, but Z370 and X370 boards are pretty much the same price, at least in Australia. Hopefully they will fix it with a later BIOS. This guy didn't get caught out by the MCE con job in his Coffee Lake review. We've seen this before on skylake, only thing is, will it be mainstream. If it isn't, it's almost useless, might as well get a k CPU if you really want to overclock. If you read then little edit it just mention new microcode locking the blck to 103. Which is a first on one of the asrock boards with the external blck generator. On the skylake you lost the use of the igp & any & all power saving features so not that great a solution anyway IMO.